I started practicing Health Qigong in 2006. Over the past few years, under the provincial and municipal General Administration of Sport, I have quickly mastered exercises and applications of four sets of Qigong, from ignorance to understanding then further to skillful applications by participating in the training and study of various Health Qigong classes held by provinces, cities, and even across the country. Years of practice has taught me the true meaning of the Health Qigong exercises. For instance, exercise of “stretching tendon and bone, revolving and bending”; imitation of five animals in Wu Qin Xi, “stretching the body to smooth meridian and bones”; pronouncing the sound in Liu Zi Jue to smooth the qi balance of internal organs; and exercises of Ba Duan Jin, that is practice contains maintaining as practice is in maintaining. All of those are finished in the state of relax, calm and natural and the integration of body and spirit to achieve the aim of preventing diseases and strengthening the health. Through the practice of the four sets of Health Qigong exercises, I have the most profound experience in Yi Jin Jing, and would like to discuss some experiences and understandings in the following. I. Mental relaxation and integration of body and spirit. Body refers to the shape and movement of human. Spirit refers to human consciousness, thoughts, and thinking. Through the changes in the movements, the circulation of qi is guided by spirit, which always moves along with body and both intertwined closely. For instance, as for Routine 3 of Yi Jin Jing, “Wei Tuo Presenting the Pestle 3”, when raising two hands, spirit is in the two palms. And Routine 4 of Yi Jin Jing, “Plucking Stars on Each Side”, spirit in Mingmen point of the waist, eyes staring in two palms. And Routine 9 of Yi Jin Jing, “Green Dragon Displaying Its Claws”, focus on the center of palm, with the cooperation between body and spirit at the same time. For example, in Routine 8 of Yi Jin Jing, “Sinking the Three Bodily Zones”, the body shaped like pressing the spring when falling on the floor, like lifting heavy objects when raising the body. And in Routine 6 of Yi Jin Jing “Showing Talons and Spreading Wings”, stretching arms and palms like pushing window, like toppling the mountains and overturning the seas, and drawing numb palms like the tide is out and in Routine 5 of Yi Jin Jing, “Pulling Nine Cows by Their Tails”, two arms move like dragging tails of two cows or spring. Bending and spreading like a hook in Routine 11 of Yi Jin Jing, “Bowing Down in Salutation”. Spirit moves with the body silently and seems to be kept or not. I remember that when I began to practice Yi Jin Jing, I did not know how to integrate spirit, only moving physically. And the cooperation of breath is passive. It is difficult to regulate the breath, and I always feel suffocating, and I even cannot hold qi before exercising the movement in place. The action is very stiff, like doing exercises. Although I was sweating, I could feel it was not in the right way. Later, I repeatedly reviewed information and disc- teaching on Health Qigong, learning, understanding and experiencing. At last I found the feeling of spirit, and immediately experienced the relaxed feeling. The spirit is relaxed, and the body would naturally sink down. II. The soft cooperation of natural breath and body movement all the time. For instance, to inhale naturally when raising two palms in Routine 3 of Yi Jin Jing, “Wei Tuo Presenting the Pestle 3” and to exhale naturally when dragging two arms in Routine 5 of Yi Jin Jing, “Pulling Nine Cows by Their Tails”. To inhale naturally when stretching arms and chest, exhale naturally when drawing them back, exhale naturally when close chest and arms, and inhale when stretching arms and the body in Routine 7 of Yi Jin Jing, “Nine Ghosts Drawing Sabers”. And exhale naturally when pushing two palms forward in Routine 6 of Yi Jin Jing, “Showing Talons and Spreading Wings”. Because the chest will expand or retract as the movements change, and then breathe in and out naturally to achieve continuity. After mastering spirit and natural breathing, combining the body movements, and after a set of exercises, I feel easy and comfortable, with smooth qi and without brute force, huffing and puffing. It is a set of continuous exercise to the end. III. Alternate kindness with severity, deficiency and excess supplement each other. Kindness and severity are always transformed with tight and loose force, heavy and light force, and the unity of opposites between Yin and Yang. For example, in Routine 5 of Yi Jin Jing, “Pulling Nine Cows by Their Tails”, revolving and dragging two arms is the severity (excess), and stretching the body with the waist as the center is the kindness (deficiency). And in Routine 6 of Yi Jin Jing, “Showing Talons and Spreading Wings”, two palms in front of chest, expanding chest and shoulder is the severity (excess), and stretching shoulder and arms is kindness (deficiency). At the same time, when pushing two palms forward, stronger muscle tone is severity (excess), and weaker is kindness (deficiency). To achieve a clear distinction between deficiency and excess, and the alternation of kindness and severity, which is deficiency and excess, kindness and severity are incorporated together to an appropriate degree. Therefore, if you want to practice well the strength of kindness and severity, you shall master the inner “secret energy”. The so-called “secret energy” is the inner strength. IV. To focus on the revolving and bending of spine. Revolve and bend the spine well, first of all, we must understand each movement and digest its meaning. The spine, the backbone of the human body, consists of vertebrae, ligaments, and spinal cords and serves as the protector of the nerve root system of the spinal cord. For instance, in Routine 5 of Yi Jin Jing, “Pulling Nine Cows by Their Tails”, the twisting of the waist drives the scapula, which can stimulate the Jiaji, Feishu, Xinshu and other points to smooth the cooperation of the ridge, heart and lungs. The coordination of the movements of the limbs up and down, can not only improve the blood circulation of the soft tissue, but also improve the coordination and strength of the limbs. In Routine 7 of Yi Jin Jing, “Nine Ghosts Drawing Swords”, pushing the body with harbor chest, twisting and arms upward push along with the spine, and then stretching slowly to open and close zhenqi, to rub spleen and stomach, and strengthen kidney, increase the power of muscle in shoulder and waist, and to improve the function of each joints of the body. In Routine 8 of Yi Jin Jing, “Sinking the Three Bodily Zones”, bending the lower limbs to cooperate the pronunciation of “hey” to make zhenqi in the body up and down between chest and abdomen correspondingly to achieve coordination between heart and kidney, and to improve the power of waist, abdomen and lower limbs, and to strengthen waist and kidney. In Routine 9 of Yi Jin Jing, “Green Dragon Displaying Its Claws”, “both sides of the chest belonging to liver”, “liver storing blood, kidney storing essence” in traditional Chinese medicine. Turning around, displaying claws left and right and bending the body forward, to tighten and loose two sides of chest alternately shall achieve the function of smoothing liver, qi and spirit, and strengthen the function of muscle in waist and legs. In Routine 10 of Yi Jin Jing “Tiger Springing on Its Prey”, the springing, back bending of the body, stretching of chest and abdomen, swagging of the body shall smooth Ren channel and meanwhile to smooth qi of three yin of hand and foot. Besides, it improves the function of muscle in waist and legs to strengthen waist and legs. In the Routine of “Ring the Tiangu (Wu Tiangu)”, flicking Yuzhen point with fingers to refresh the brain and ears to eliminate tiredness of the brain. 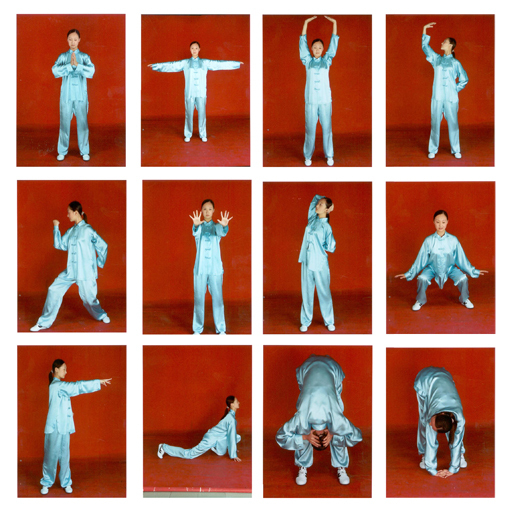 In Routine 11 of Yi Jin Jing “Bowing Down in Salutation” and Routine 12 of Yi Jin Jing “Swinging the Tail”, are guided by bending of head, neck, chest, waist and hip vertebrae one by one to smooth Du channel on the back. Bending forward to raise head and stretching the body left and right could have both Ren channel and Du channel and qi channel of the whole body fully exercised and also have the flexibility of waist and legs improved. To exercise these movements slowly and gently and experience carefully the feeling of the body and unexpected results will be achieved. “Liver controls feelings, heart controls spirit, spleen controls thinking, lungs control worry, and kidneys control fear” is advocated by traditional Chinese medicine. The five internal organs of human beings are like rivers, and each river intersects with one another. If any one of them is not smooth, it will be clogged up and deteriorated, and people will get sick and be knocked down by the disease. In order to get a healthy body, we shall first regulate the body's five major circulatory systems, which is equivalent to creating a good environment inside the human body, so that the body's cells grow robustly to prevent and treat diseases and delay aging. The old saying is like “If you have smooth breath, you won't ache, vice versa.” That is the reason. Yi Jin Jing is the golden key to open the body's five organs. It helps you to regulate the body, breath and mind slowly and softly, stretch Jin and bones, revolve and bend, and open up meridian and vessel through exercises to make the body's five internal organs flow smooth and finally to keep fit. Every time I practice, I feel comfortable, relaxed, pleasant, and energetic and have my eyes brightened. It is can be seen that Health Qigong is a very excellent sport. In 2007, I qualified for a social sports instructor in Health Qigong and participated in the National Health Qigong Competition twice and achieved good results. In the past ten years, I persisted in spearheading practice and coaching Health Qigong every day. My greatest feeling is that fitness is the greatest asset in life. Without fitness, we are not able to enjoy the money regardless of the amount; without fitness, we lose the foundation of my life dream, even if we are ambitious; and without fitness, we would still be unhappy due to lack of life quality even we live much longer. The only priority thing is that health is the greatest happiness of our life.